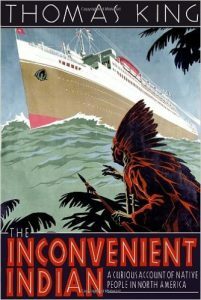 Why are indigenous voices not called upon for witness accounts of events? 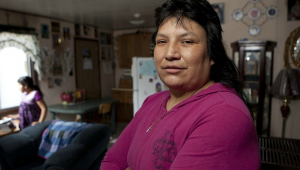 Why are missing and murdered aboriginal women portrayed through dehumanizing descriptors? Why are missing and murdered aboriginal women under-reported by major media outlets? Indigenous peoples perspectives, voices, knowledge systems and presence are largely exempt form critical forms of communication through various media platforms. For this reason, indigenous peoples are reclaiming their voices and re-asserting sovereignty over their spaces, culture, and various forms of representation. Indigenous peoples are implementing screen sovereignty through indigenous produced media platforms. Kristen Dowell in “Vancouver’s Aboriginal Media World” identifies the decolonizing act of production and direction of media platforms by indigenous peoples as a form of sovereignty, the decolonizing nature of digital media and film productions, breaks down oppressive barriers emplaced by colonial regimes. Screen sovereignty pertains to the method of a visual, film or media production being produced by aboriginal peoples. This act of production is sovereign because it establishes control and authority over a space by directing the narrative, perception, audio, text and execution of whichever message is being conveyed. Further, it acts to revitalize connections amongst indigenous peoples by reigniting conversation amongst community members and a sense of comradery. The existence of Visual Sovereignty, located in the act of production, is evident throughout the interactive website God’s Lake’s Narrows. The site creators, Alicia Smith and Kevin Lee Burton, reposition the aboriginal perspective to the forefront of the media interaction experienced by the audience by producing an audio piece to accompany the visitors while navigating the site. This maintains control over the narrative. The text that accompanies the audio while introducing upcoming photos, also maintains control over the narrative. 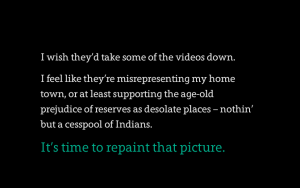 This indigenous influence in producing the interactive site by reclaiming the narrative, despite a heavily manipulated colonial framework of thought and perception of a particular space, is an example of effective visual sovereignty. God’s Lake Narrows confronts the harmful stigma of indigenous reservations by redirecting a visitor’s perspective through visual and audio forms of cinematic methods. The God’s Lake Narrows website further exemplifies screen sovereignty through its method of production. The site facilitates and fosters a shared connection, as well as a shared common goal, to execute a project with an overarching message of sovereignty and decolonization for community members. This use of text asserts visual sovereignty by confronting a racial stigma against First Nations peoples about the money “given” to them by the Canadian government. The text and accompanying pictures allow for the indigenous community to take control of the narrative and communicate their truth and reality to outsiders. By allowing community members to be photographed in their own homes in a stylistic way in which the visitor is not looking in on the reserve, judging the reserve and community members, but rather the community members are looking outward at the visitor. This style of portrayal reconfigures the relationship between indigenous and non indigenous peoples, changing the colonial dynamic through media portrayals by reclaiming authority of a space and how it is conveyed. As you enter the homes of community members, the accompanying audio production changes. The music becomes more upbeat, with the voices of community members speaking over the music announcing community events, placing a food delivery order, discussing the prices of groceries. This stylistic process is humanizing and restores a relatable connection between indigenous and non-indigenous peoples. This is an important feature to include for pursuing a decolonizing and self-determinative media space by confronting the stigma of indigenous peoples as ‘wards of the state’ and incapable of managing their own affairs. Screen sovereignty is a critical tool in the pursuit of decolonization and asserting self-determination and sovereignty. Lack of sufficient media coverage for aboriginal peoples has significantly influenced negative perceptions and stereotypes towards First Nations and indigenous peoples on a global level. The lack of indigenous voices throughout various media platforms has encouraged racist stereotypes against indigenous women, men, aboriginal youth, indigenous communities, and reserve life. Missing and murdered aboriginal women are under reported and misreported- dehumanizing terms are used to describe cases, desensitizing the public from the gravity of this crisis. Aboriginal men and women are portrayed throughout news and media outlets as drug addicts or alcoholics, homeless and ‘wards of the state’, neglecting to address the displacement and cultural genocide that has and continues to take place. Aboriginal youth are committing suicide at staggering rates. The conditions of reserve life and the isolation and racism experienced by aboriginal youth are underreported by major media outlets. Screen Sovereignty allows for aboriginal peoples to reclaim their voice, and direct the narrative. This act of sovereignty and decolonization is essential for widespread healing and assertion of self-determination. Reclaiming digital media spaces and production processes actively dismantle oppressive colonial narratives that have worsened the lives of aboriginal peoples. You raise some vital questions here, Alexandra and you work out some important ideas via your analysis of GLN and screen sovereignty. I am a little unclear as to why you chose this particular title. In what ways ways do you see sovereignty as something that can be bought and sold? I chose to play on this title as a confrontation of how screen sovereignty is a vehicle for authenticity by indigenous voices through a decolonial narrative… this got me to thinking about the question of indigenous authenticity for visitors.. visitors to a website, visitors to land, visitors to a museum and how indigenous authenticity is sold without consent. I.e. canadian tourism shops throughout Vancouver that sell “REAL” carved replicas of totem poles or other native paraphernalia but these aren’t authentically produced. key word, ‘produced’ as production is a critical aspect of screen sovereignty… this thought process all came full circle for me stemming from idea of screen sovereignty and how indigenous authenticity is attempted to be sold. play on words. next time i will include a descriptor for the title at the bottom of the page! Ok. Be careful with irony in blog posts. There is a lot of risk that you will not be interpreted in the way you intended. Without careful description, which you offer in the above comments, but not in the post itself, this title comes across as a little glib.